Signature cocktails and something blue are two wedding traditions that couples rarely do without. California’s Bronco Wine Company’s Blanc de Bleu sparkling wine (boasting natural flavors and certified color) makes it possible for couples to have their blue and drink it, too—responsibly, of course. Featuring a kiss of all-natural blueberry extract, the sapphire-hued sparkling wine lives up to its namesake fruit by delivering a dry and crisp flavor with a hint of green apple. The newly introduced 187-milliliter bottles are perfect for pre-ceremony sipping, proffered from trays, as party favors, or in a signature cocktail. “The delicate flavor adds a lovely note to a signature cocktail,” says Claudine Kielson of the Los Angeles–based Scarlette Bartending. To illustrate Blanc de Bleu’s versatility, Kielson crafted this colorful custom sipper. Prepare an absinthe rinse in a Collins glass with ice (optional). * In a mixing glass, gently muddle blueberries with lemon juice. 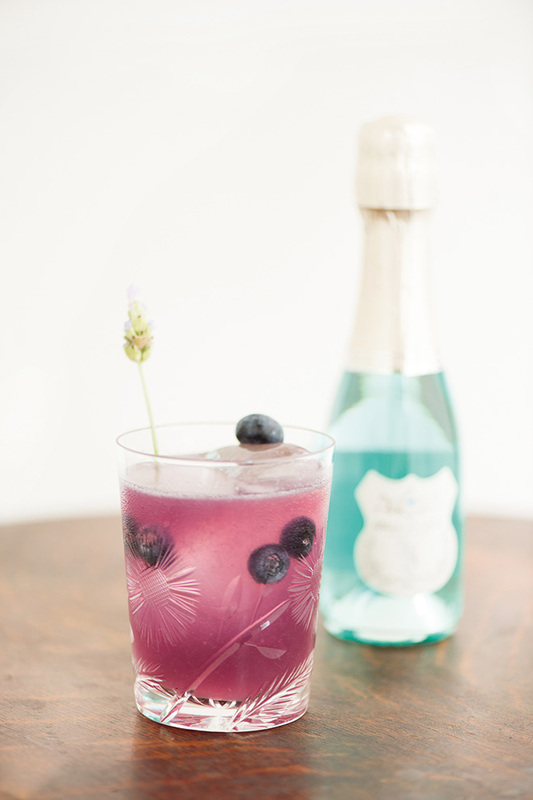 Add Scarlette’s lavender-infused vodka, crème de violette and ice. Shake 10–12 times. Toss absinthe from Collins glass, add ice and strain mix into glass. Top with Blanc de Bleu and garnish with lavender.